So this week our insta-feeds were filled with body parts proudly displaying red crosses and captioned with bible verses about freedom. Social media can be a dark place but it can also be a force for collective good when we join together for a shared purpose. The current number of posts with the hashtag #enditmovement is currently 213,700. Each post is a message of hope, it makes the statement, ‘those who are trapped in modern day slavery, we stand with you’ but as always, internet movements fill us with conviction but then pass by and leave us with the feeling…what next? We made the promise to help, announced to our followers just how wrong we feel modern day slavery is, but now what? What can we practically do to help those trapped in suffering, abuse and exploitation? We are always being bombarded with statistics and desensitised to huge numbers. There are 20-30 million people currently in slavery. I read this stat from the Relevant post ‘Modern-Day Slavery By the Numbers’ (which is SO worth a read by the way) and I continued reading through the article but I felt a tug at my heart to read the number again, and again, until the magnitude of that figure actually sunk in. Can you imagine a room filled with 20-30 million people? Probably not, it’s tricky to do right? What’s harder to do is to imagine each one of those people with separate characteristics, personality traits, dreams, ambitions, parents, experiences, hopes. Each number represents a life. Each life represents a family, a friendship group, a community. If we gloss over statistics and don’t pause to try to imagine those figures as real people, all they will ever be is a number. A number won’t stir your soul the way a person will, a real breathing, desperate person. So this is the hard part. The red cross offers a mark of defiance on your Instagram, but now comes the part where you can actually practically channel your definance. The bleak statistics may make us feel powerless, tiny, helpless but there are ways you can contribute. We can’t all start non-profits but we can support the ones that exist. We can’t all be Christine Caine but we can be freedom fighters in our own right. 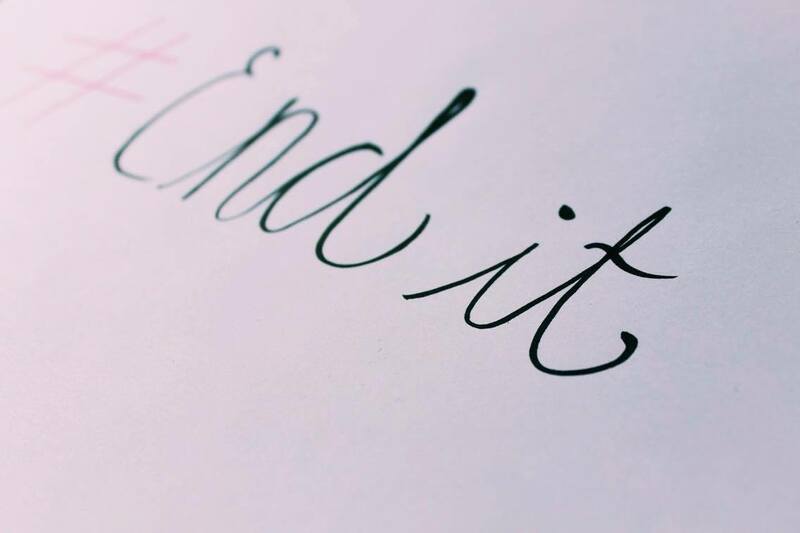 The ENDIT movement is made up of a coalition of 16 charities who are doing amazing work that you might want to check out if you feel convicted to help, there are details of all 16 on the ENDIT website. We all have an individual responsibility as humans to help lift others out of slavery. That doesn’t mean single-handedly deconstructing a trafficking ring- you don’t need to be a vigilante to be a freedom fighter. As well as supporting huge organisations, if you want to make more of a personal impact on the issue and feel particularly stirred why not consider boycotting some items. You can check out your slavery footprint here, not for the purpose of making you feel guilty but to empower you to realise you have the power to make lifestyle changes that could contribute to the cause. I in no way wish to undermine the use of social media, it’s such a powerful tool to spread messages of hope and to unite us in defiance against slavery. The purpose of those messages though is to convict people to actually move, to not only feel stirred up and passionate but also to realise we can all make a difference to the life of someone we may never have met, to set them free and enable them to live out of constant restriction and fear. I hope you feel encouraged that there are practical, meaningful ways in which you can support the ENDIT movement. Why is it important to be yourself?